On the 50 states map to the right, Alabama's location is highlighted. The State of Alabama is bounded by Tennessee on the north, by Florida and the Gulf of Mexico on the south, by Georgia on the east, and by Mississippi on the west. Alabama is the 28th largest state in the United States, covering a land area of 50,744 square miles (131,426 square kilometers). There are 67 counties in Alabama. This Alabama map site features road maps, topographical maps, and relief maps of Alabama. The detailed, scrollable road map displays Alabama counties, cities, and towns as well as Interstate, U.S., and Alabama state highways. The pannable, scalable Alabama street map can be zoomed in to show local streets and detailed imagery. to view a scalable Alabama road map. The detailed Alabama map and the regional Alabama map display cities, roads, rivers, and lakes as well as terrain features. The detailed map shows only the State of Alabama, while the regional map shows Alabama and the surrounding region. Alabama's capital city is Montgomery. Other major cities found on the Alabama map include Birmingham, Mobile, and Huntsville. Birmingham is a major telecommunications hub and manufacturing center; Mobile is a leading Gulf Coast seaport and Huntsville is an aerospace research and development hub. Notable transportation infrastructure projects include the Tennessee-Tombigbee, or Tenn-Tom, Waterway and the Natchez Trace Parkway. In 2005, the population of Alabama was estimated at 4,548,327, which is about 89.8 people per square mile. In 2010, Alabama's population rose to 4,779,736 people. The state's Interstate Highways include I-10, I-20, I-59, I-65, and I-85. The name Alabama comes from the Choctaw language, and means "thicket clearers". Northern Alabama lies in the heavily wooded Appalachian uplands. A wide band of rich, fertile soil crosses the central portion of the state while the Gulf coastal plain in southwestern Alabama consists largely of swampland. The Mobile River and its tributaries — the Alabama River and the Tombigbee River — form the chief river system. For additional Alabama travel and tourism information, visit the official Alabama tourism site and Alabama Atlas. This online Alabama reference map shows major cities, roads, railroads, and physical features in Alabama. 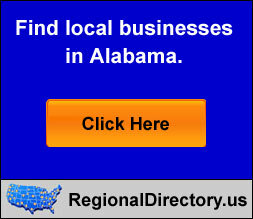 Several map publishing companies offer printed maps of Alabama. For example, Omni Resources offers several maps of Alabama that feature points of interest, airports, and parks, as well as selected local attractions and insets of major Alabama cities. Alabama-Map.org Editor, State Maps, PO Box 775, Barnegat, NJ 08005.